It’s a Good Day Sunshine! Meet Sunshine. This sweet little pup was dumped on the side of a busy highway. Luckily for her, there was an angel on her side who witnessed the horrific act and quickly ran across the road to scoop her up. To add heartbreak to her story, it was immediately evident that she was in poor health. The rescuer took her to Apollo Support and Rescue, an AMAZING organization that took immediate action to get her care. After her initial visit to the vet, it was found that she had double lingual hernias and X-rays showed they were intestinal. Surgery was needed–a very tricky operation due to all the nerves and major blood vessels to the body also going through the area. Her vet bills were going to be very costly and Apollo Support and Rescue was faced with the daunting task of raising the money quickly. About this same time, Legacy Animal Foundation heard about Sunshine’s plight and stepped in to help. It has been two days since Sunshine’s surgery, and already her days are looking brighter! Not only is she recovering nicely with no signs of complications, she has been lovingly adopted by one of the veterinarian’s technicians. We love happy tails…don’t you? If you’d like to help us create more happy tail stories, please make a donation today. Escaping his family’s yard, John Wayne wandered into a next-door neighbor’s house and was shot. Unfortunately, his owner was unable to afford vet care and John Wayne was left to suffer on the owner’s back deck that night. When news of John Wayne’s plight broke through the neighborhood, several generous and concerned neighbors donated money to get John Wayne to a local vet. Yet, when it was learned John Wayne would need to have the leg with the bullet amputated, the cost was greater than the money raised, and the owner was faced with the decision to put him down. One special neighbor refused to give up. At her encouragement, the owner surrendered John Wayne and he was taken veterinarian who would treat him at a discounted cost. Legacy Animal Foundation joined the fight to ensure John Wayne’s medical bills were paid in full. While John Wayne may have unduly lost his leg, all is not lost. His aftercare will be provided by a loving foster family who plans to make John Wayne a permanent member in their home! Thank you to all who helped us make this a happy “tail” for John Wayne, and so many others. We are counting on you for continued support. Please help by donating now. With the number of needs that exist among at-risk animals in our country, it is easy for me to often feel that we do not do enough. Then I hear the appreciation, tears and joy from an owner or rescuer of an animal we helped bring back to health by funding its medical treatment, and I am reminded that Legacy Animal Foundation did, in fact, do enough for that one animal! It wouldn’t be possible to save even one pet if not for the tireless efforts of our board and the generous hearts of our supporters. I am so proud to be associated with both of these groups. In just three years, we have increased our grant giving by 643 percent! That’s beyond amazing! A simple thank you doesn’t begin to cover my gratitude. Maybe, however, taking a look at some of our Happy Tails stories will say more than I can express. I am excited about where Legacy Animal Foundation is headed in 2018. We are looking forward to bigger and even more fun events that will help us raise the money we need to help more at-risk animals. We are enacting a plan to grow our relationships with rescue groups and area shelters in an effort to identify more animals in need of our assistance. And lastly, we will begin working towards one of our bigger goals, the Legacy Awards Gala. To everyone who has attended one of our events, “Liked” our Facebook page, shared our stories, given to our cause, or reached out to us for help … I say “Thank you” from the bottom of my heart! It is my honor to work alongside of you on behalf of animals in need. You are creating a lasting legacy! Often times, it is those who have it the hardest who sacrifice the most to help animals in need. This is the case with HomeComings Dog Rescue. Only two weeks prior to rescuing 16 ill dogs, including seven puppies with Parvo, this well-organized rescue group was victim of identity theft, leaving their bank account completely empty. Only days after the rescue, more Parvo puppies were rescued from Texas with many having additional illnesses like pneumonia and coccidia. With a total of 29 sick dogs in rescue and no money for vet care, HomeComings Dog Rescue was facing euthanizing these poor pups, something that goes completely against the mission behind their existence. Upon learning the story from one of the organization’s foster volunteers, Legacy Animal Foundation stepped in to provide some much needed financial assistance. We are sad to say, however, the need is so great that it wasn’t enough. We are committed to doing more with your help. If you’d like to help these pups in crisis, you may do so by donating through our YouCaring page. On an out-of-the-way road, a passerby witnessed the hit-and-run of a young pup. At less than a year old, Austin had been hit by the front end of a car and run over through the back end of the vehicle. The driver of the car kept driving. Fortunately for Austin, the passerby called the local shelter for help. As with so many municipal shelters, they wanted to help but simply did not have the funds for an injured animal. However, the shelter’s volunteers stepped in and rushed to Austin’s rescue. He was taken to an emergency hospital where it was discovered that not only did Austin have internal injuries, he also suffered from rat poisoning. He was losing blood quickly and was in serious condition. Not knowing where the money would come from for Austin’s care, the veterinarian treating him took blood from her own dog to reduce medical costs and to save Austin’s life. At the same time, the volunteers contacted Legacy Animal Foundation for help. After a few days of intense care, Austin was released from the hospital to finish his healing in a caring foster home. Austin owes his lucky break to the person who witnessed his horrific accident, the kind-hearted volunteers who came to his rescue, the veterinarian with the determination to save him, and to all those who generously gave to Legacy Animal Foundation and made it possible for us to cover the expense! Your legacy begins today! Make a difference in the life of an animal in need — donate now. Tuesday evening, Kristina and her fiance sat in front of the television watching the tragedy unfold in front of their eyes. Horrific scenes from hurricane Harvey’s path left them feeling helpless. Then a post on Facebook from a hurricane Harvey group for animals caught their attention. A woman was asking for assistance with a small kitten that she found in a McDonald’s parking lot and looked as if it had been hit by a car. The woman lived nearby. While trapped in by three sides of their neighborhood, the only open passage out just happened to be in the direction to this woman’s house. Kristina took that as a sign that she needed to save this kitten. Within one hour of the post, Kristina and her fiance knocked on the woman’s door, fell in love with the kitten and placed a call into their vet. The kitten looked so weary and hungry. That night, Kristina began to worry about the expense this little guy was going to bring with him. She became all too familiar with the high cost of medical treatments when one of her Dobermans had battled and beat Parvo. Yet, Kristina believed she couldn’t let that fear stop her from saving this little kitty. The next morning’s vet visit brought news that kitty’s leg was broken, he had an ulcer on his eye and large cuts throughout his body. Then the estimate for his care came and Kristina’s spirits sank…momentarily. She thought, “Well, I better buckle down and work extra hours to make sure this gets taken care of!” She posted an update on the same group’s Facebook page where she first learned about the kitten and asked for donations for his care to be sent directly to the veterinarian. The response was overwhelming, yet it was just shy of half of what was needed. Legacy Animal Foundation learned of the kitty’s situation and Kristina’s determination to see the little guy get the help he needed. We were so inspired by both of them, we took steps to cover kitty’s remaining medical bills. “My heart is so overwhelmed, I cannot put into words how happy and relieved I am that this little kitten is going to be OK, and that I will not be in debit for years over his medical bills,” said Kristina. Many asked Kristina in those Facebook messages, “Will you be keeping Harvey?” She hadn’t even though about it. All Kristina had cared about up until this point was that he was OK. So with the medical bill fears put to rest, Kristina turned to her fiance with the question. He responded, “Well babe, we have Thunder and Lightning….why not Thunder, Lightening and Hurricane Harvey?” So, it looks like kitty Harvey will have a new home and two Doberman brothers to boss around once he’s recovered. Please join us to help more hurricane victims like Harvey by giving to Legacy Animal Foundation, and let your legacy begin today! UPDATE: Harvey is doing great! His eye improves every day and there is a strong chance he will keep the eye. His leg has completely healed. Harvey has adopted one of his big Doberman brothers as his partner in crime–and we’re told they get into a lot of crime! Mom wants to surrender King to a local shelter. She can’t. King doesn’t belong to her. The shelter will only accept a surrender from the owner. King belongs to her son with special needs and no money to care for him. Sadly, King has become a victim of neglect. King is a 10-year-old registered male German Shepherd. He is one of the sweetest dogs you will ever meet. King loves other dogs (and even cats) and is very good around children. Due to the neglect, he has suffered from a nasty ear infection for over a year and a hot spot that grew to the size of an orange. Legacy Animal Foundation learned of King’s situation and stepped in to cover the medical costs for his treatment. Two weeks later, King is healing nicely. An active pursuit for King’s new home–one where the love he so freely gives will be generously returned–is taking place. If you have a special place for this sweet boy, contact us at info@legacyanimalfoundation.org. Your legacy begins today! 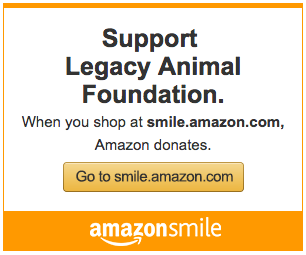 Make a difference in the life of an animal in need. UPDATE: King has completely healed, and the good news doesn’t stop there. King has also found a new home! His new mom desperately wanted a German Shepherd, and when she was introduced to King, it was love at first sight! King is sure to enjoy the king’s life now! The Picasso wanna-be’s came out today to paint portraits of their pets at Legacy Animal Foundation’s Paint Your Pet fundraiser. One hundred percent of all money raised will go towards helping an animal in need. Thank you all for joining us and showing off your fabulous painting skills! We really did have some Picasso-like painters in the group. Fabulous work! There was great fun to be had by all who attended our Bark-n-Brew event this past Saturday! Two-legged participants enjoyed making new friends and tasty brews offered up by Shannon Brewery, while four-legged participants enjoyed playing, ear scratches and belly rubs on the dog-friendly patio. It was a great turnout, and we thank everyone who joined us to make this day special! A huge thank you to Shannon Brewery for opening their doors for this fun event and That’s Amore food truck for providing some good eats. A portion of the sales from this event will be donated to Legacy Animal Foundation to help an animal in need. Kane wandered into a homeowner’s garage. After several unsuccessful attempts to shoo Kane out of the garage, the homeowner called Animal Control to come and get him. Upon Kane’s arrival at the shelter and seeing the condition Kane was in, the rescue coordinator contacted the rescue group A Chance To Bloom for help. It was evident, Kane was going to die if someone didn’t take action right away to save him. The obvious signs indicated Kane suffered from a disturbingly bad case of mange. So much so, he had eaten three legs to the bone trying to find relieve from the itch and that were now severely infected. He was extremely malnourished with spine and pelvic bones protruding to the point of causing raw spots on his skin, and so little muscle mass it was difficult for him to move. It appeared from the look in Kane’s eyes, he had given up hope. A trip to the vet also found Kane was anemic from worms, heart worm positive and had a broken tail. In spite of it all, Kane showered everyone in the vet’s office with his sweet and loving demeanor. Only a few days following vaccinations, de-worming, antibiotics, spray gel for his wounds, medicated baths every other day, and lots of supplements to boost his body’s immune system, Kane began to brighten and his skin started to show signs of improvement. The vet commented that with the right care, Kane stood the chance to be a very handsome and strong boy. But that care was going to come at a great cost. Kane will need to undergo more treatment and medicine to get healthy enough to endure neutering and heart worm treatment. Legacy Animal Foundation has agreed to cover these costs so those who took him in could care for him without the worry of how to pay for it. The caring, tireless efforts of A Chance To Bloom with the generous donations given to Legacy Animal Foundation have bestowed a hope within this precious boy–the hope he thought he’d lost. Kane now has a chance to bloom! Update: Kane has made a remarkable transformation! Following treatment for mange, worms, open wounds and neutering, he has become one handsome fellow. His foster care has provided some amazing TLC and has gone above and beyond to ensure his future is filled with puppy dreams with play groups and proper socializing. Kane is ready for adoption–you can see the eagerness to begin a new life in his sparkling eyes!